The Irish tradition of metalworking dates back over 3,000 years to the Bronze Age; the Tara Brooch is considered to be one of the finest examples of ancient Irish metalworking craftsmanship. It is a “ring brooch,” dating back to the late 7th or early 8th century. Despite its name, it does not have any historical attachment to Tara, traditionally seen seen as the seat of the High Kings of Ireland. 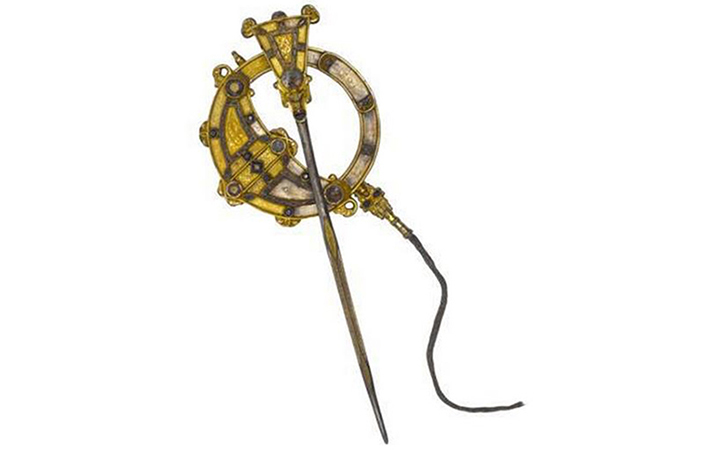 Rather, it was found in 1850 in Bettystown, County Meath and was later acquired by a jeweler who named it “The Tara Brooch.” The brooch is now on permanent display in the National Museum, Dublin. The original Tara Brooch was made of silver gilted bronze, decorated in gold filigree with embellishments of amber, gold, glass, and copper. Elaborately decorated, there was a piece of finely woven chain attached to the brooch, which indicated it was probably part of a pair. Two brooches would have been worn – one on each shoulder – linked by a chain, to hold a cloak in place. Perhaps this is why the Tara Brooch is traditionally worn on Irish dance dresses.